Gene Stone, T Colin Campbell, Ph.D., Caldwell B Esselstyn, Jr. It may overturn most of the diet advice you’ve heard—but the experts behind Forks Over Knives aren't afraid to make waves. In his book Prevent and Reverse Heart Disease, Dr. Caldwell Esselstyn explained that eating meat, dairy, and oils injures the lining of our blood vessels, causing heart disease, heart attack, or stroke. In The China Study, Dr. Colin Campbell revealed how cancer and other diseases skyrocket when eating meat and dairy is the norm—and plummet when a traditional plant-based diet persists. And more and more experts are adding their voices to the cause: There is nothing else you can do for your health that can match the benefits of a plant-based diet. 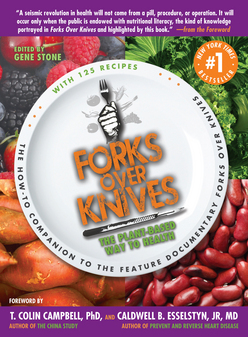 Now, as Forks Over Knives is introducing more people than ever before to the plant-based way to health, this accessible guide provides the information you need to adopt and maintain a plant-based diet.